This recipe is quite fool-proof really. It is fairly easy to do and very satisfying. To make it more of a meal by itself you could add a vegetable or two that could cook in the braise with the meet. Not only do they take on some of the flavor of the braise, but they add flavor to the braising liquid which later becomes the sauce. Depending on what you're making, some vegetable suggestions would be carrots, turnips, parsnips, potatoes, or cabbage. Smoked ham hock stock (see below) or chicken stock to come halfway up the meat. Preheat oven to 325º. If there is a lot of extra fat on the meat start by trimming some of that off. Season the meat on all sides. Brown it on all sides in a saute pan. Meanwhile heat up the stock in another pan until it is boiling. 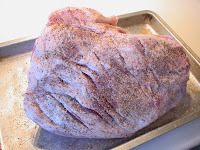 Transfer the browned meat to an appropriate sized roasting pan or Romertopf. Pour the stock over the meat, and also add the wine at this point. Cover with tin foil and put in the oven. Cook for about two hours then flip the meat and return it to the oven for another hour. Peel the carrots and add them to the braise. Cook for another hour. During the whole cooking time the liquid should be just barely simmering. Remove the meat and the carrots from the oven and transfer to a cookie sheet or something. You may need to use tongs to help with this process. Bump the oven temperature to 400º. 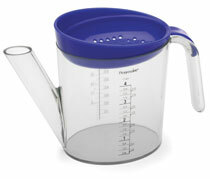 Strain most of the liquid from the pan into a large measuring cup, bowl, or gravy separator. Return the meat to the pan and put back in the oven for another thirty minutes. 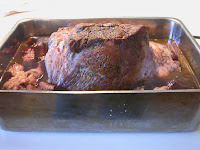 Baste with the braising liquid frequently. To make the sauce, put the vinegar and ginger in a saucepan and simmer for a few minutes. Strain the ginger out. Pour three cups of the strained braising liquid into the saucepan, and bring to a simmer. Reduce by one half (there should be one and a half cups left), maintaining a simmer. Turn of the heat and whisk in the butter one piece at a time. If you want to simplify this recipe you can forgo this sauce and just simply use the braising liquid. Although this sauce will add a nice touch to the dish. Remove the meat form the oven, and break into serving size pieces. Arrange on a serving plate with a carrot or two. Spoon some of the sauce over the meat. I like to serve this dish with a little cranberry hot sauce (recipe follows), or this is a VERY good premade sauce you can buy, although it could be hard to find locally. 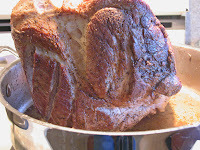 To see a picture of this dish see the post below (Jan: What Makes a Braise). What you see in the photo is just a piece of the shoulder. You'll likely be able to find these at your local grocery store. They're not really expensive (we paid $3.65 for those on the left). and they make for a wonderful stock. If you save and freeze the hocks from your hams, those will work for the stock too. Just go to "Dec: Stock Making" and use the hocks in place of the bones. Also, saute the vegetables some before adding them to the stock. When the vegetables are almost done sauteing, add 1/2 cup of tomato paste and continue to cook until it puts off a sweet aroma. also add two or three chipotles in adobo (smock-dried jalapeños, in adobo sauce). These add an exciting element of spice and more smokiness to the stock. Chipotles should be readily available in the supermarket. If not, you'll definitely find them in a Mexican supermarket or specialty store. 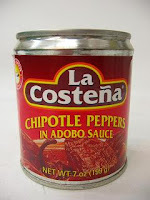 La Costena is the brand I use. For a printer friendly version of this recipe click here.